Canada has always been a top destination for U.S. online sellers that want to test the waters of an international audience. Our northern neighbor's proximity, coupled with the fact that many of its residents speak English, make it the perfect first step to expanding a business beyond our borders. Most impressively, as much as 60 percent of online Canadian shoppers buy from American merchants. But despite the inherent opportunities for ecommerce business, an upcoming change in postal rates will impact cross-border shipping; and businesses should be aware: On May 31, the U.S. 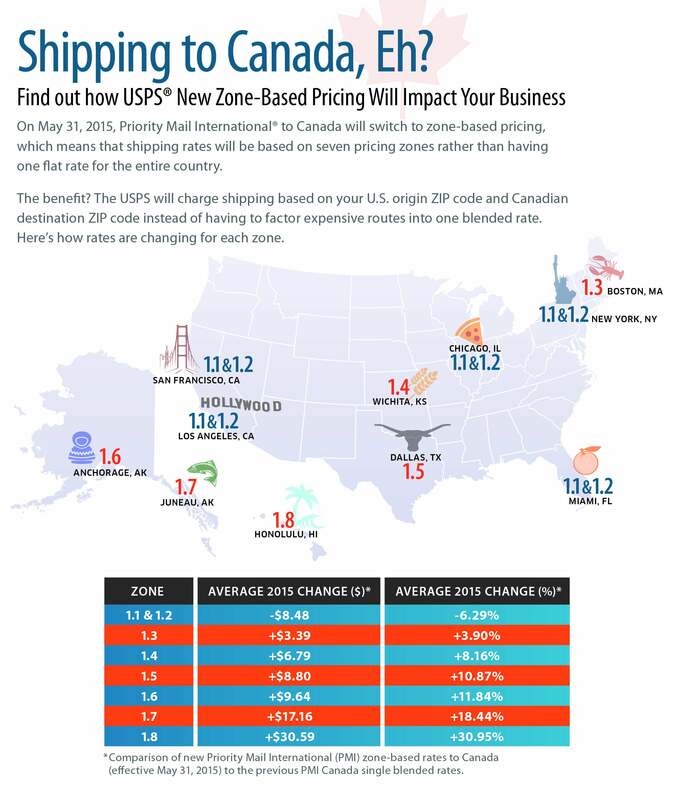 Postal Service (USPS) will switch to zone-based pricing for priority mail international shipments heading to Canada. That means shipping rates will be determined by the U.S. ZIP code of origin together with the Canadian destination postal code -- much the way the USPS already prices packages shipped within the United States. Until now, the postal service had only one rate for parcels being shipped to Canada: A package shipped from the Grand Canyon to Toronto cost the same as one shipped from New York City, even though the distances and routes the package traveled were vastly different. Now, there will be seven U.S. pricing zones, allowing the USPS to offer more precise shipping rates instead of factoring expensive routes into one blended rate. Depending on where your online business is based, this news means different things: The new zone-based pricing considers not only how far a U.S. city of origin is from its Canada destination, but also shipping routes. If a business is located in a region where the majority of goods originate (e.g., near a USPS international service center), its sender will see reasonable costs -- even savings. As an example, consider Miami your city of origin. Although that Florida city is in the southern United States -- far from Canada -- it’s considered Zone 1.1, and senders based there will see savings of about $8 per package. Shippers in San Francisco and Chicago, also major shipping cities, will see similar savings. Businesses in those hubs will save the most money on packages weighing under 1 pound. or more than 13 pounds. Those shipping from a destination far from Canada, or located in a remote area, such as Wichita, Kansas (Zone 1.4), or Anchorage, Alaska (Zone 1.6), will likely see price increases. The average increase for Wichita is $6, while Anchorage's is $9. It’s also worth noting that for now, rates will be consistent across Canadian destinations. That means a package shipped from New York to Toronto will cost the same as one shipped from New York to Vancouver. However, future price changes are expected, so shipping rates to different Canadian regions may differ. The first thing businesses should do is determine their new zone, understand how they’ll be affected and update their product-pricing strategy accordingly. The visual below recaps some of the new zones and their average increases; you can download a spreadsheet that will help you determine your specific zone here. Whenever prices change, businesses should also take the time to reexamine their shipping mix and make sure they’re choosing the right carrier for every shipment. As a rule of thumb, the USPS generally provides the most affordable rates for businesses shipping lightweight products to residential addresses -- and even internationally. In contrast, private carriers provide competitive rates for heavyweight shipments sent to corporate addresses. But private carriers also tack on fees -- not revealed until after the delivery is made -- such as fuel or delivery surcharges. So be sure to take a close look at your invoices to understand the true cost of your shipments. While potential price increases are never fun, staying informed and planning ahead can help businesses mitigate these changes. That way, those businesses -- yours, too --can continue to grow their presence in Canada, and beyond.